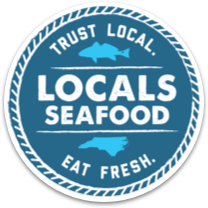 We encourage customers to bring a cooler when picking up seafood. We will gladly pack ice with your purchase no matter how far you are travelling. Even a short trip in the summer heat can reduce the quality of your purchase. It is a good idea to complete all of your other errands before buying seafood so you can go straight home. Once home, immediately place your seafood in the coldest part of the fridge. Make sure it’s not too crowded with other items. The coldest part of a fridge is the back. If your fridge has an icemaker, store your fish at the back of the top shelf. If your fridge does not have an ice maker, store your fish at the back of the bottom shelf. Oysters and clams should be stored in the refrigerator in an open container. Never add water to live shellfish. There are different requirements for some shellfish like live crabs that need circulated fresh air. Our market staff will make sure you are informed on any special storage requirements. You should eat your seafood within 3 days of purchase if kept fresh. Decide when you will be eating your catch as soon as you can. If you will not be eating your purchase in the next 3 days, go ahead and freeze it. You don’t want to wait a few days and then decide to freeze. Don’t be afraid of freezing your purchase – freezing at the time of purchase locks in the freshness and flavor. Many fish species freeze well, but some do not. Fish high in oil and fat will not freeze well. This include species like bluefish, mackerel, and mullet. We do not recommend freezing live shellfish such as clams, hardshell crabs, or oysters. It is a common practice in North Carolina to freeze shrimp, crabmeat, and soft shell crabs to enjoy in the off season. When you’re ready to eat, take your fish out of the freezer and place the bag in a bowl of tap-cold water. Wait 30 minutes and check by squeezing the fish to see if it has thawed.